I'm a professional associate of the SAA. I have tutored art beginners classes at the Eccles Community Gallery and at EVAN events. I ran creative Workshops at Mazart Studios for more experienced artists. I work one to one with both beginners and more experienced artists, introducing them to media and techniques. I'm currently working with a group of mature students at Mill Gardens, coaching, mentoring and encouraging them to pursue arty activities. 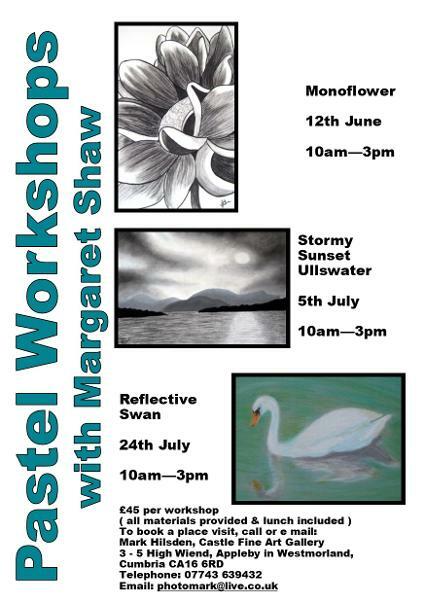 Through the spring and summer I'll be delivering Pastel workshops in Castle Gallery in Appleby . I'll be delivering a short pastel workshop at the Warcop Art Fair on Saturday 4th May. I live in Kirkby Stephen, Cumbria ( postcode CA17 ), so If you're looking for a workshop/tuition within my vicinity, contact me to discuss what I can offer you. If you're interested in how I approach my artwork, visit the Work in Progress Pages on this site. You'll see my processes for recent pieces - mistakes included. I also give talks on my photography from an artistic perspective - contact me to discuss what I can offer you.